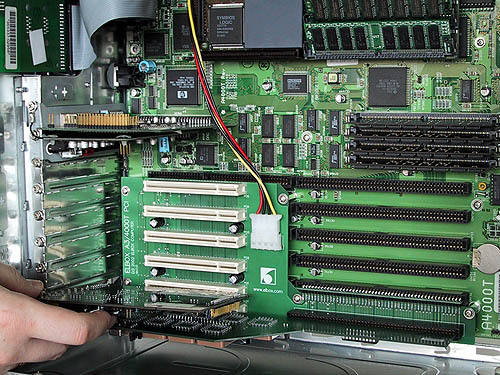 A PCI busboard which is designed for use with the A4000T (Genuine) and A3000T (Genuine), however it is compatible with most towered A1200s already fitted with another Zorro III busboard, or A4000s housed in the E/BOX 4000. 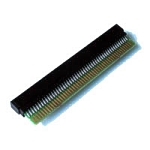 This busboard is designed to attach to your motherboard or busboard and make use of it's existing Zorro III slots. It allows you to use up to four of your Zorro III slots, (only 1 full length card can be used, the rest must be half length) and one video slot. 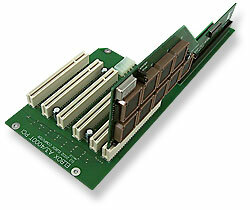 A bridgeboard called the Mediator PCI 4000 is connected to both a Zorro III slot, and a PCI slot on the card. It is possible to use more full length Zorro III cards if required, however you must fit a mini riser card in each slot where this is required. These are not supplied with the busboard but must be purchased separately.